Think about every culture you can imagine and there’s a bread product. It might be sliced, puffy, flat, spongy or crispy. Breads are a staple, luring us in with the need to contain our other foods so neatly. Now we can add “waffle” to the list of types of bread. What’s that? You say waffles are as much a bread as are pancakes? Well, ya, they kind of are – as long as you can slather something on them or put ingredients within them, they are a bread in my book. 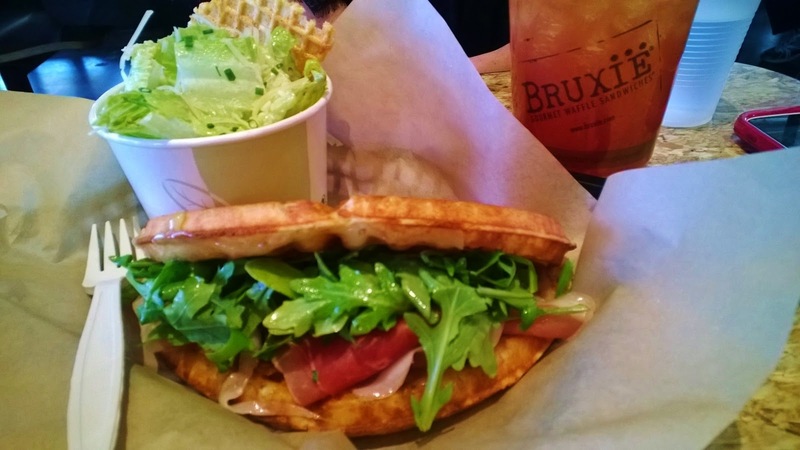 And apparently in the books of the owners of Bruxie Gourmet Waffle Sandwiches which opened its first Denver location this past March. Rooted in Southern California, the fast-casual restaurant makes a light, airy, not sweet version of a Belgian waffle and shapes it, taco-like, to hold various ingredients. Open from morning till night, you can start your day with a Bacon, Egg & Cheddar sandwich (Applewood Bacon, Tillamook Cheddar, mayo and a jumbo egg) for $6.95, or Green Eggs & Ham sandwich with grilled ham, cheddar, mayo, an egg and arugula pesto ($7.25). Or move into lunch or dinner with the Bruxie Burger with an Angus beef patty with Tillamook cheddar, tomatoes, pickles, mayo and crisp lettuce $7.50. While this might be especially hard to imagine with a waffle for a bun, we were told the light texture of the waffle, soaking up the burger juices is to die for. We’ll give it a go next time, minus the dying part. Although there are a lot of tempting options like the Roasted Mushroom & Local Goat Cheese with basil, arugula and a balsamic reduction ($7.95), or a Hot Pastrami with gruyere, cider slaw, spicy brown mustard and pickles ($8.95), we had the Buttermilk Fried Chicken and Waffle sandwich with chili honey and cider slaw for $7.50. They use Colorado’s own Red Bird Farms Chicken. It was very tender, juicy and just crispy enough. Good stuff! The Prosciutto di Parma & Gruyere sandwich was mild, as you would expect of those two ingredients but got some heft from the addition of arugula. We passed on the suggestion to add an over easy egg and wish we hadn’t. It would have leant a nice creaminess. We’ll know better next time. It isn’t all about the savory. Waffles and sweetness go hand-in-hand so there’s Nutella and Bananas with Sweet Cream for $5.95 or the S’Mores with Belgian chocolate, graham cracker and toasted homemade marshmallow fluff for $5.95. We ordered the Lemon Meringue “Pie” with a tart lemon cream, gram cracker and toasted marshmallow for $5.95. It was presented with a stack of napkins and the warning of “you’re gonna need these.” And we did, with wonderful marshmallow ooze punctuated by the seasonal berries we added on. Mmmmmmmmmessy. Yes, a person can just get a good ol’ waffle with syrup and butter ($5.50) but they can get so much more including Poutine (crispy waffle fries with cheddar cheese curds and old fashioned brown gravy for $7.95), soup, salads including the best Caesar Salad I’ve ever had made with a Parmesan Waffle Crisp. You can order this as a meal or get it as a side when you make your meal a combo. If you like perfectly balanced anchovy and garlic, you’ll love this salad. The staff has been accurately trained to describe it as “flavor-forward” meaning you’d better like anchovy and garlic or don’t order it. I do and I did. 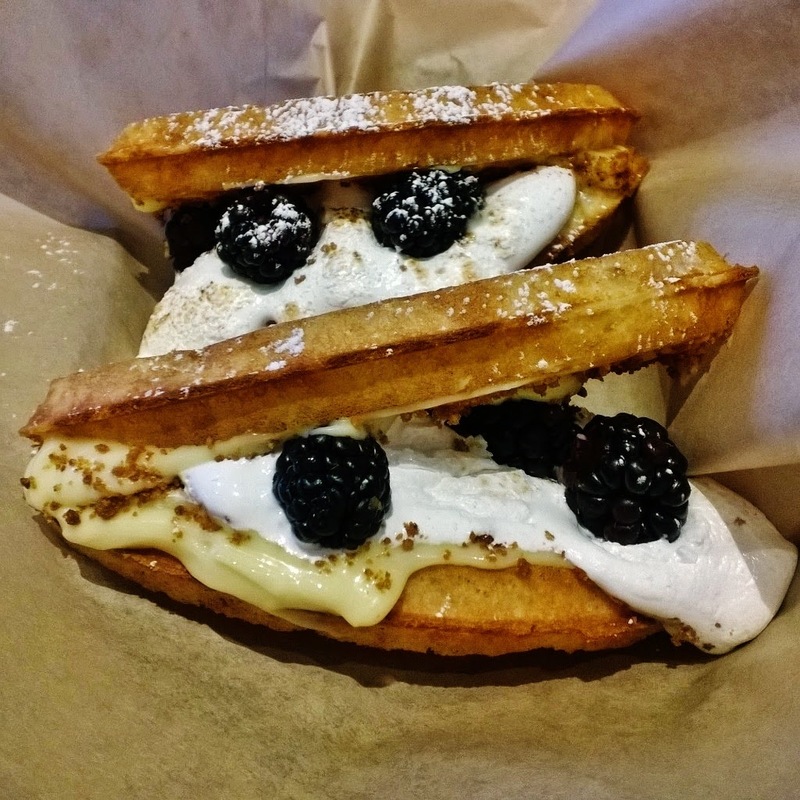 If you consider Bruxiewaffles as being all grown up, there are also options for the kids, ages 8 and younger for $4.95 that include a drink, small waffle fries or fruit plus one of four kinds of Bruxie waffle, perfect for their palettes. The Denver location at 1000S. Colorado Blvd. in Glendale, adjacent to Barnes & Noble is in a great spot with plenty of parking and easy access. Their next location will be in Boulder and then a third somewhere back in Denver once they have a loyal following, which won’t take long. While the food was good but didn’t knock my socks off (except for that Caesar), I did feel comforted by comfort food taken up a notch. I left, already considering what I’ll have on a return trip, planning to try it out for their breakfast items…and then late one night for dessert…and maybe again for lunch or dinner. Dang! Lured in again – this time by the newest bread of the world. This post originally appeared on the In Good Taste Denver blog and is reprinted here by the author. Visit the blog for news and reviews of restaurants, theater, movies and travel in Denver and beyond.